In spite of AMC playing musical chairs with its writing staff, The Walking Dead has managed to keep up two traditions since its sophomore year: the deck-clearing mid-season cliff-hanger and the lacklustre buildup episode that precedes it. With the fall finale just a week away, nothing much happens in “Crossed” beside Dawn bickering with Beth, Rick tying up some patrol officers, the Washington squad turning tails, and Gabriel reminding us of his idiocy. Just the same, I can’t bring myself to use the term “filler” in regard to a show renowned for its stocktaking conversations. Take, for instance, the twisted argument between Dawn and Beth, who nearly dooms her comatose friend by speaking out of terms. Their status quo remains largely the same by the end of “Crossed”, but I like how the hospital tribe’s leader subtly exposes herself by helping her ward sneak medicine to Carol. I’m sure Officer Lerner thinks she’s displaying her best attributes, which is to say her compassion for others and ability to work around the rules. What she’s really showing fans of The Walking Dead, though, is her cowardice: her willingness to risk the lives in her care instead of taking responsibility for the corrupt system she herself put in place. This doesn’t bode well for the upcoming trade with Rick. Once again, Deputy Grimes finds himself at odds with his fellow tribesmen, eager to eradicate the latest threat rather than open communication channels. The difference lies in his trusting his friends enough to both argue his radical position and then concede to their more compassionate alternative. It occurs to me Rick has sort of become the Shane of the group, pushing for bloodshed the minute he feels “Crossed” (see what I did there?). However, The Walking Dead may prove him right, given what happened with the Terminus clan at the end of “Strangers”. Certainly, it doesn’t help that Sasha just got played like an X-Box One at a twelve-year-old’s birthday party. 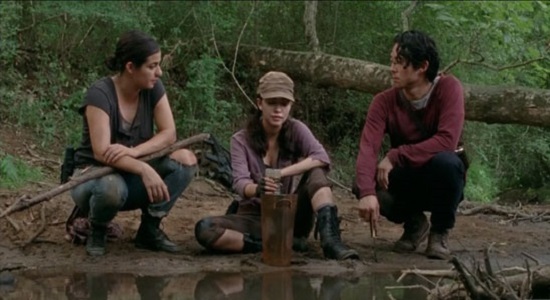 Meanwhile, the Washington squad has split in two, with Glenn, Tara, and Rosita out for a stroll while Maggie whines about her existential disappointment to a catatonic Abraham. The farmer’s daughter doesn’t reveal anything we couldn’t have surmised from her previous ramblings about hope and purpose in “Self Help”. However, I’d argue her soliloquies in “Crossed” have got less to do with her own reasoning than Abe’s parallel thought process as he fights his way back to reality. It’s a neat narrative trick, one we haven’t seen before on The Walking Dead. Having mentioned that, my favourite thread in “Crossed” belongs to Glenn, who can sure get the ladies talking! Consider how easily he gets the two brunettes on The Walking Dead to share their feelings while fetching water. 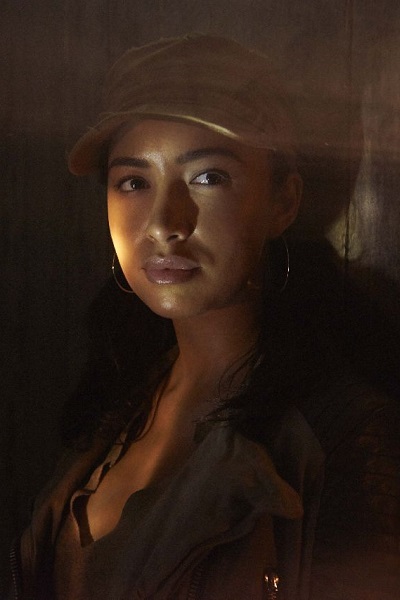 As expected, Tara relates to Eugene’s vulnerability in the walker apocalypse and advocates for the same level of compassion she was afforded in “Inmates”. Rosita’s perspective proves more revealing. Convinced that she can contribute to any group, the young woman finds herself untroubled by the absence of a zombie cure. After all, one doesn’t need to change the world to find purpose in it. This leaves us with the Babysitter’s Club over at the chapel. I like Carl’s almost careless attempt to rehabilitate Gabriel, his teenage assumption that everyone can adapt to the new world order as quickly as he did: “Hey, dude, here’s a machete to decapitate your former congregation. We cool?” Of course, the padre is going to freak out! I just wish “Crossed” had shown us a different side of the character, as it feels like we’ve already spent half the season watching the selfish moron screw things up over and over again… Is it too late to retract what I wrote about “filler” on The Walking Dead?